If you’ve ever been to one of our locations, hopefully you’ve given our signature chimichanga dish—the chicken poblano chimi—a try for yourself. 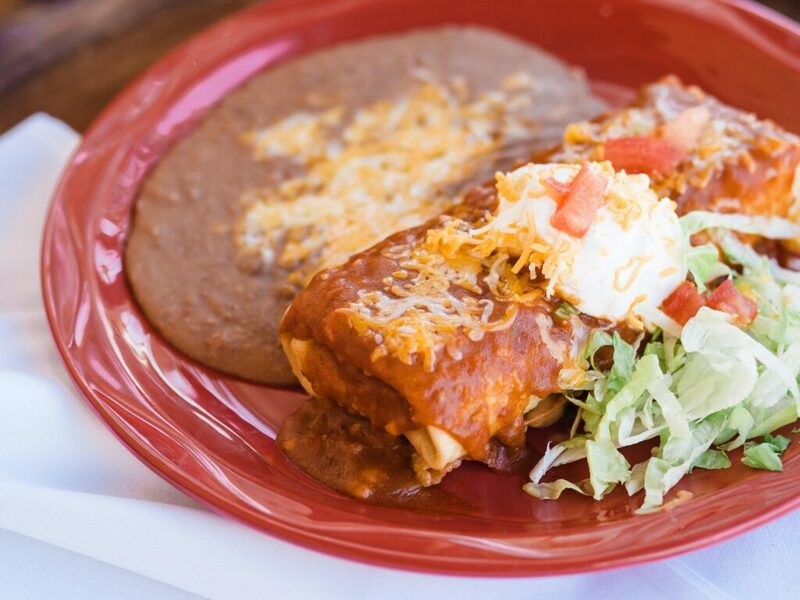 This dish was created by our very own founder’s granddaughter and features a farm fresh poblano chile stuffed with seasoned chicken, wrapped in a crisp tortilla, and topped with our homemade “Sedona Red” sauce and signature Baja sauce. If you’ve yet to try our delicious chimi dishes, you can at least become informed about the history of chimichangas in the meantime! Essentially, a chimichanga refers to a tortilla that’s stuffed with some kind of filling (usually meat or, in the above example, poblano chiles! ), deep fried, and topped with some kind of sauce. When you think about it, the chimichanga is actually quite similar to a burrito, with the added step of deep-frying. The end result is a nice, crispy outer shell surrounding a yummy, hot filling. Each bite brings forth a surge of delicious flavors and textures. We’re getting hungry just thinking about it. Believe it or not, the story goes that our very own founder, Woody Johnson, first invented the chimichanga several decades ago (although there are many other restaurants that like to make a similar claim). The best part? Woody came up with this dish entirely by accident. You see, he was actually just trying to make a traditional, meat-filled burrito when he accidentally dropped the wrapped burrito into a deep fryer. Little did he know that this little “mistake” would turn into a new dish that’s now loved across the country! It’s a good thing he didn’t toss that “accident” into the trash when he fished it out of the fryer, right? Today, we have many different chimichanga (or “chimi,” for short) dishes to choose from, all stuffed with different fillings to suit your taste buds. If you’ve never tried a chimi before, you simply have to make it out to Macayo’s to order one from its original place of invention. Whether you want one stuffed with beef, steak, poblano chiles, or anything in between, we’re sure to have something on our menu that you’re going to love. Celebrate with Us! Receive a Chimichanga Coupon! Because of our long-standing history with the chimichanga origin story, we proudly hold a “Chimi-Fiesta” at Macayo’s every year. Each year around the same time, we bust out some special chimichanga menu items that are absolutely amazing. Last year, for example, we featured the chicken poblano chimi. That’s not all, though. For each chimi sold, we donated one dollar to the Arizona Diamondbacks foundation. This was a great opportunity for us to give back to the community wile also celebrating our roots by serving up some of our favorite chimi dishes. As you can see, the chimichanga has some interesting roots, and all right here at Macayo’s in Arizona! And if reading this didn’t leave you craving a chimichanga, we don’t know what to tell you. Stop by any Macayo’s location and give one of our original chimichanga dishes a try for yourself. We’re sure you’ll enjoy a little taste of our history!